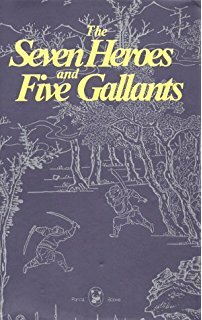 C. A. Cooke-- The Seven Heroes and Five Gallants is one of China’s oldest and greatest masterpieces of literature, and one of the founding works of thewuxia (WOO-shee-A) genre. Wuxia translates to “martial hero” and is applied to the genre of literature and cinema concerning the adventures of wandering martial artists in ancient China. A typical wuxia story follows honorable martial heroes through their dealings with bandits, evil warlords, and even demons. A perfect example of how this story formed this genre can be found within the section “Sleek Rat Helps an Old Man.” A young warrior known as Sleek Rat discovers a landlord has kidnapped his tenant’s daughter to ransom more money from him. Sleek Rat pays the ransom, then waits; under the cover of darkness, Sleek Rat rescues the daughter and punishes the landlord. Thus, he has proven both his gallantry and his skill. Throughout the centuries, wuxia became popular and crept into cinema. The current Ip Man films about a Kung Fu master righting wrongs through the Japanese and British occupations of Hong Kong owe their beginnings to novels like The Seven Heroes and Five Gallants. The novel, and the genre, have both withstood the test of time. 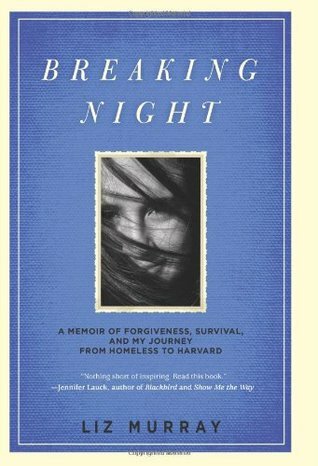 Margaret McNellis-- Breaking Night by Liz Murray is a memoir about forgiveness and finding one’s own drive and personal power. It’s a story of homelessness and isolation, of family, friendship, and hardship. I recently had to read this book for work, and it was one of the most heart-wrenching, beautiful memoirs I’ve ever had the pleasure (and at times, displeasure) to read. The writing is clear and captivating, and Murray’s voice jumps off the page to surround the reader in stereo from the start of the prologue. The obstacles that Murray had to overcome—even as a young child—seem insurmountable, yet she inspires with her determination and love for her family, particularly her mother. Her relationship with her mother, and with herself, are central, though Murray expertly demonstrates how those two relationships define all the others in her formative and teenage years. Fair warning: If you’re going to read this book, I recommend a box of tissues... Or at least a break every now and then. Yet, it’s worth the strained—or even snapped—heartstrings. Michael Allen-- Pardon my lack of macho manliness, but I don’t think I’ve ever cried as hard at the end of a novel as I did when I finished reading The Goldfinch, by Donna Tartt. For me, this book was a mountain of woman-made words like nothing I’ve ever read, or seen, or hiked before, nor will I ever again. The power and sway of the writing makes the story feel plotless throughout, yet still completely captivating. The love of art and craftsmanship is brilliantly sewn into a weighty coming-of-age story, a bildungsroman, that cruises the line between this stinking, sinking, cluster-truck of a world; and the invisible, unknowable, un-improvable space between, behind, and in front of the ciphers I’m punching in now. Jaw dropping description. Irreverently religious. Un-piously holy. A masterpiece of a story derived from an obscure masterpiece painting that miraculously survived destruction in the 1600s, which gets stolen by an unwilling hero who also miraculously survives destruction. Not for those who like a simple hero’s journey tale. Some critics don’t like it. But for me it was unpredictable and sprinkled with untethered brilliance. Oh, and I guess it won some kind of an award, or something.